Thailand has many real estate portals, but it takes almost a year on average to sell a house in the country, says entrepreneur Natthapon Asswisessiwakul. He blames this on at least two things. First, many of the houses on property listing sites carry sky-high price tags, no thanks to exorbitant broker commission and fees that are tucked into them. Second, the sites are filled with incomplete, fake, and outdated listings from brokers due to lack of verification. If you’re a buyer, this means you might be paying for a lot more than you should, while a bogus listing is a total waste of your time. Asswisessiwakul knew these pain points, having worked at property research and consulting firm CBRE for seven years and founded his own brokerage firm after that. Seeing the opportunity, he launched ZmyHome in late 2015 as a way for people to sell, rent out, and buy houses without the help of a real estate agent. With US$400,000 in fresh capital from KK Fund, ZmyHome aims to give home sellers and buyers the confidence to transact on their own by providing them accurate massive data. That’s how it intends to stand out from other property listing sites like PropertyGuru’s DDproperty. “We want a clean and well-organized platform similar to the hotel industry,” says Asswisessiwakul. Only property developers or home owners are allowed to post on ZmyHome to ensure that the information is true and up-to-date. They must provide a title, deed, or any government document that indicates the house’s identification number and names them as owner before a listing is approved. This minimizes the possibility of a fake listing, says the founder. It also supposedly guarantees buyers the best prices by excluding the middlemen. Broker listings usually include commission and other fees charged to either the users or the sellers. And given that most sellers will figure the fees into their price, buyers pay indirectly too. One thing that’s keeping individuals from selling direct is that they don’t know how to price their properties. ZmyHome offers data on sold homes in a specific location, allowing sellers to study it and compare. 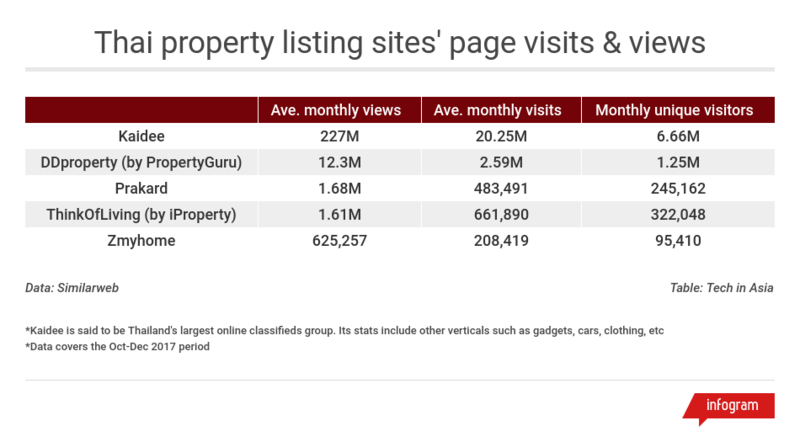 Buyers looking for properties get access to the data as well. Asswisessiwakul says they get owners to update the status of their properties as either “available” or “sold” on a monthly basis via Facebook and phone calls. Listing on ZmyHome is free, and the startup charges sellers per impression – they won’t have to pay if potential buyers don’t see their properties. “Most platforms in Thailand are dominated by agents because [the platforms] want to accumulate listings and charge a listing fee,” Asswisessiwakul contends. The startup has 30,000 approved listings on its site, of which over 33 percent have been sold or rented. Thai real estate developers such as LPN, Riche Place, CPLand, and Real Asset have also been using ZmyHome. So far, they’ve sold over US$3 million worth of properties on the site. Like other marketplaces, the company needs to attain network effects to succeed, meaning it must attract a critical mass of buyers and suppliers. These network effects create high barriers to entry – once many buyers and sellers are using a marketplace, it becomes harder for a new rival to lure them away. That’s a challenge as ZmyHome still needs to get its name out there and faces off against strong rivals with more experience and funding. Thailand’s real estate market is worth US$20 billion per year, according to Thai accelerator Dtac Accelerate, but it’s not clear how much online transactions account for in that figure. What’s certain is that the opportunity is huge enough that it created a crowded and competitive market. Similarweb data shows ZmyHome is lagging behind its key rivals in terms of site visits. ZmyHome says it gets 1.2 million page views monthly, but Similarweb pegs it at over 625,200. Achieving network effects is tough because for you to attract buyers, you need sellers – and vice versa. It’s a chicken-and-egg problem. While there’s plenty of expert advice on how to break the impasse, ZmyHome’s model might initially face more difficulty building out the supply side. ZmyHome’s no-brokers rule for posting limits its pool of suppliers, while the requirements needed for approving a listing could slow down the process of onboarding sellers. Asswisessiwakul confirms this in a response to Tech in Asia. “We ask owners to provide more details and property images to help buyers investigate the market. It’s more difficult to post on our platform compared to competitors.” Listings get approved within 24 hours if they provide complete information, images, and supporting documents. If they don’t, it takes three to four days. Yet network effects and having first-mover advantage aren’t enough to succeed, according to Andrei Hagiu, a former Harvard Business School professor, and Simon Rothman, partner at Greylock Partners. “Entrepreneurs should really focus on being the first to create a liquid market in their segment,” they write in the Harvard Business Review. A marketplace must prove its value to both sides, or else it becomes vulnerable to later entrants. “If users do not derive significant value on a consistent basis, they will readily jump ship,” they say. It seems this is what ZmyHome is hoping for by offering more transparency and competitive pricing to the market. “Successful transactions are necessary for owners and buyers to learn about the platform,” notes Sompoat Chansomboon of Dtac, which also backs ZmyHome. Moving forward, ZmyHome plans to accumulate more sellers with a “listing score.” The higher the score, the more priority a property will be given in searches. This means ZmyHome will set minimum requirements for approving a listing, but the seller who supplies more information will get a higher score. It will also expand its user base to include banks (which sell foreclosed properties) and foreign property owners. Asswisessiwakul says listed properties situated in high-demand locations and priced correctly are able to sell within three months, while others remain on the site for over a year. He plans to bring the average selling time down to three months – “similar to mature markets such as the US and UK” – by developing a price suggestion system. This way, sellers don’t have to research and compare prices or price properties on their own. Calling sellers to get an update on the status of their homes is manageable when the pool of users is small, but what happens when you’re talking about millions of sellers? We also asked how the team verifies the authenticity of the documents submitted to the site. Asswisessiwakul didn’t comment, except to say that buyers report listings that have wrong information or might have not come from the home owner. Converted from Thai baht. Rate: US$1 = 31.93 baht.